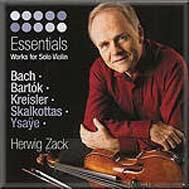 Herwig Zack (concertmaster of the Stuttgart Chamber Orchestra for many years) is a thoughtful violinist, and this programme meets my preference for CDs that are unique in one way or another. I have (and have enjoyed reviewing) discs of Bach partitas and Ysaye sonatas, but I would rarely go back to them. Zack writes good notes and explains the particular significance to himself of each of these choices; it was Skalkottas that caught my eye, and his solo sonata is a welcome addition to my large collection of this favourite composer of mine, sadly still underestimated and not regularly played. This is an early work, 1925, before he studied with Schoenberg. It is "radical, fresh, spare, mischievous, dissonant, motoric, temperamental" etc (Herwig Zack), and sits comfortably amongst these better known names. The music sounds well from the Chamber Music Hall of Wurzburg, where Zack is Professor for Violin and Chamber Music. The sequence runs well this well packed disc, and is best heard straight through - with a pause after the Bach. Zack's previous CD resurrected the forgotten French composer Catoire, also worth investigating.